Travel Agent proposes an interactive travel through the subjective eyes of the artists. A camera moves through the city streets, eager to discover unseen places. Images and sounds reveal the city's hidden bricks, the flow of information on which it is built. Behind the camera, an invisible traveler asks us for guidance, interrogating the visitor’s conceptions of travel, whether he is a stranger only passing by or a local visiting his own town through his interaction with the piece. There is always a sense of spatio-temporal immersion when in the city. The physical surroundings, sounds, smells, colors and people around simply embrace us. The paths we choose to take and the way we choose to look are the building blocks of our relation with the urban space. Travel Agent proposes an interactive travel in the city through the subjective point of view of the artists. A camera moves through the city streets, eager to discover unseen places. Images and sounds reveal to our eyes the city's hidden bricks, the flow of information on which it is built. Behind the camera, an invisible traveler asks us for guidance. The piece interrogates the visitor’s conceptions of travel and tourism, whether he is a stranger only passing by or a local visiting his own town through his interaction with the piece. 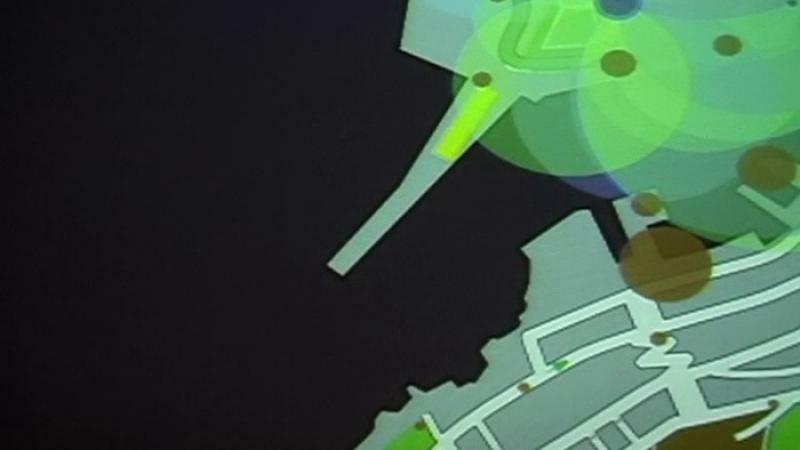 As we filmed this journey around the different neighborhoods, wireless networks data were collected, accumulated and linked to the images and sound captured in the surroundings. By visiting this intangible data space, the visitor sees and hears this invisible reality that is surrounding us in our everyday life, passing through our body. This virtual space represents the canvas on which were shaped the different concepts and thoughts that, once integrated one to the other, form the main body of the work, each part of it influencing the movement of the others. As media artists questioning themselves about interactivity in contemporary art, we explore the paradigm of the user interface. The loneliness that is characteristic of most everyday life electronic interfaces, like the computer mouse, the ATM machine or the game environments, brings the user to develop habits that he has to unlearn once he’s confronted to the possibility to interact not only with the interface he’s using, but also with other users that are also giving inputs, each and every one of them influencing what is given to see and ear.